Whether you are applying as a first year J.D., transfer, MLS, LL.M. or one of our Health Care certificates, know that you are taking the first step to enter an institution whose reputation, influence and esteem reaches far beyond our walls. 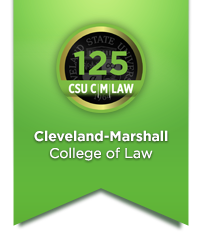 By choosing to learn law at CSU Cleveland-Marshall College of Law, you can become part of a global community of practitioners, leaders, and scholars who also learned law in our exceptional environment of mutual respect, academic excellence, and service. "I remember people helping me for no reason. If you meet at networking events, the willingness of other attorneys to say 'I want to see you succeed, what can I do?' is amazing. Plus, it's a fun place for young professionals, and the cost of living in Cleveland is so affordable."